A Bird Hunter's Thoughts: Blue Highways. What are you missing? On my way to a national Field Trial in Nebraska, after loading the Beast and dogs and what I needed for a week of bird dogs and such, I took to the Interstate on a well-travelled route. I swear I could put the Beast in the grooves, set the cruise control and take a snooze, I'd taken this road so many times! In a way, it was a comfort as landmarks ticked by. I even recalled stops with certain dogs, long gone, and trucks, long sold and gone to the scrap-heap. I do it every trip and it provides me with a mental mile marker list. Back in the day, I would pore over maps (you remember the paper kind, right?) and try to spot a shortcut. Most times, my fancy shortcut wasn't. Over the years, I came to realize the Interstate system was faster. It was comfortable. It was plain, white bread, vanilla America. Just like the Yankee, who marvels at southern grits and cornbread and sweet tea, or the magnolia-mouth southern sweetie who is indignant when a New Yorker doesn't want to chat for 10 minutes about "momma and the family" before giving directions- regional differences are disappearing. We expect, as a people, to see, hear and smell the same thing coast to coast. The Interstate does that for us. That's a loss for us. Apparently, I've been living in a bubble all of my 63 years. 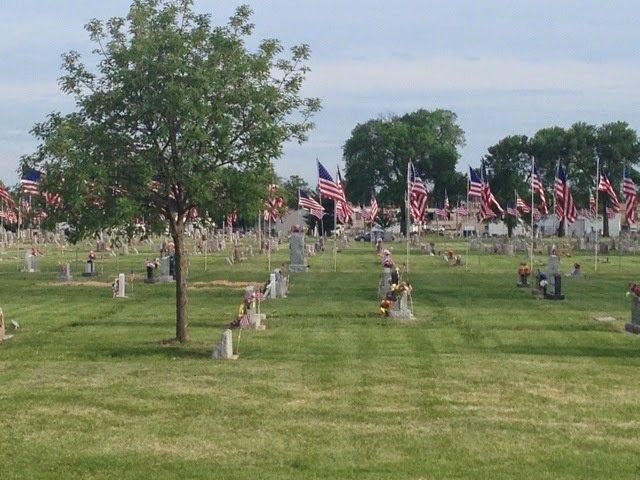 The day I chose to drive to Nebraska was the Friday of Memorial Day Weekend. "So what? ", I thought. Well, here's what. I've never seen traffic so bad in all my life. From Atlanta to Kansas City, it was heavy to completely stopped, at times. I lost hours of travel time. It seemed like every car had six kids and pillows in the windows and a passenger or two asleep. By the time I reached central Missouri (not my favorite stretch of Interstate on the best of days), I'd had my fill. I exited near Columbia, MO and headed north. The was NO WAY on God's Earth I was going anywhere near Kansas City with all these cars on the road. I'd rather drive the Blue Highways. In Mexico, MO, I saw the American Saddlebrd Horse Museum! Who knew! I joined US Highways that were Interstates in every sense of the word, with 70 mph speed limits, but with no traffic. 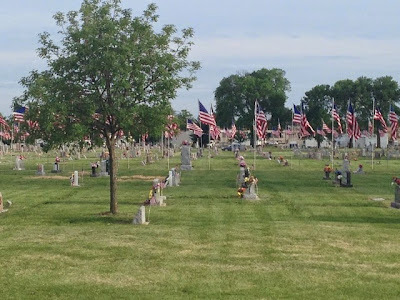 I kept pushing North to hit a major east-west US road and went through Centralia, MO, where the cemetary was decorated in flags. I had to pull off and gather it in. In Chillacothe, MO, I was talking to my long-suffering spouse on the phone and neither of us could figure out how to pronounce the name! A quick exit, and 10 minutes later, I had my answer courtesy of a lifelong, and proud, resident. In Brookfield, MO, an old man sat down and told me about 30 years of hunting quail with his two best friends. He shot a 28 ga. auto-loader and had some fine dogs. He lost his friends to old age and his desire to hunt at about the same time. I passed Gen. John Pershing's home, and farms and clean roads, tight fences. I passed white painted farm houses and signs that read, "planting season, watch for big equipment". Mostly, I passed flyover America. My kind of America. Blue Highway America. Amazingly, I made it to my destination in plenty of time, well-rested mentally and physically. I talked to some nice folks and learned some pretty cool stuff along the way. Not one of them told me I should be taking the Interstate.